The PADDLE STEAMER PRESERVATION SOCIETY (PSPS) is Britain’s longest established, largest and most successful steamship preservation group. As a registered charity founded in 1959, the Society has over 3,000 members across the UK and overseas. Through associated charitable companies it operates the only two working paddle steamers in Great Britain. Without the PSPS there would no longer be the opportunity to sail on a Paddle Steamer in Great Britain. To preserve paddle steamers in sailing condition. The Society’s two paddle steamers are listed in the National Historic Fleet (NHF) as being of pre-eminent national significance and have benefited from grants received from the Heritage Lottery Fund. The Society also supports other paddle steamer projects including Maid of the Loch and Medway Queen. To educate the public in the historic significance of paddle steamers in the Nation’s maritime and industrial heritage. 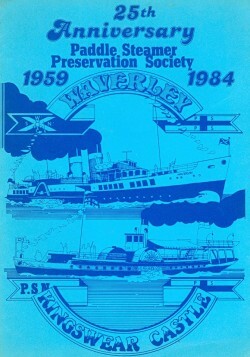 In 2011 Waverley was presented with an Engineering Heritage Award by the Institution of Mechanical Engineers. To acquire, preserve and exhibit a collection of equipment and material associated with paddle steamers. The PSPS Collection with over 44,000 fascinating objects including posters,souvenirs, paintings and fittings represents the UK’s largest and finest collection of paddle steamer heritage material. The collection continues to grow with further donations welcomed. Both skilled and unskilled voluntary work are essential for the continuing operation of the Society's ships.